The phrase 'form follows function' is probably a bit overused, but I believe it still applies as much as it ever did. It came to my mind while I was listening to the Elipson Planet L speakers. 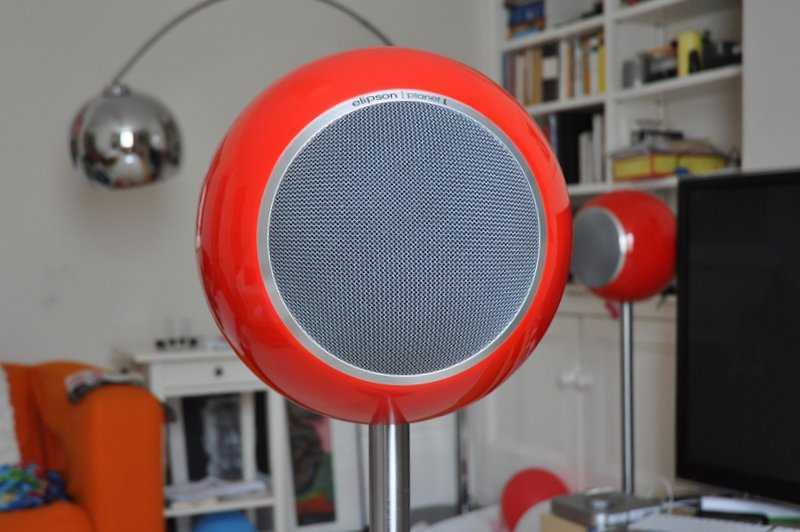 It would be very easy to dismiss these speakers as a life style product because of their cool and attractive shape, but I think there's more going on here than meets the eye, and the form could well be explained by the function. Let's start with a good look at the speakers. They feature a 30cm spherical enclosure with a concentric, or coaxial, driver, consisting of a 6.5 inch paper midwoofer with a 1 inch soft dome tweeter at the centre. The cabinets are ported at the back and made from some sort of resin. They are single wire only (fine with me), through very nice, Elipson branded, terminals. The drivers are protected by a stylish metal and foam grille that attaches magnetically to the speaker cabinet. These loudspeakers can be put on a stand or any other firm surface with a set of rings provided. Further options are wall mounts and even ceiling mounts, utilising steel wires, but mine actually came with sturdy stainless steel floor stands that match the style of the speakers very well, although some of my visitors thought the base was too big in relation to the speaker itself. This does make it very stable, of course, especially as the base is very heavy. The speaker cable can even be pulled through the stand's tube, making it almost invisible. Mine came in a very attractive shiny red colour, but you can also have them in black or white. Does that sound like a life style product? Probably yes, but that still doesn't mean it isn't a decent speaker as well. That's because almost all of these things also make perfect sense from a sound quality point of view. A spherical enclosure prevents internal resonances and is strong and resistant to vibration. It also is the perfect shape for preventing reflections caused by the sharp edges of more traditional cabinets. And a concentric driver may look good, it also minimises phase errors and gives a very even distributions of the sound in all directions, certainly in combination with the spherical shape. Even the robust and heavy stand helps to prevent vibration and coupling to the floor. And that is the true meaning of the phrase 'form follows function': a design that is only optimised to do whatever it is supposed to do as well as it possibly can will often also end up looking good. The fact that these speakers are made from very nice materials and finished perfectly may help too, but the fact remains that there's actually nothing ornamental on these speakers and everything about them basically serves one purpose: reproducing music. Did I mention they are French? They do remind me of the better French cars: elegant, quirky and surprisingly practical, all at a reasonable price. Vive la France! For what it's worth: I actually find them stunning, and most visitors seemed to agree. And there's also no denying that they work very well: they are easy to put together, easy to connect, easy to position, and they don't take up much space. Everything about them seems to be very well engineered and beautifully made. Build quality is exemplary, certainly at this price. Other manufacturers use spherical enclosures and/or coaxial drivers too, but most are more expensive or smaller than the Planet L's, not to mention less good looking, making these Elipsons seem like very good value in comparison. I tried them with the grilles on first, and they certainly look good that way, but the design mantra mentioned above seems to have met its limits here, as the Planet L's do sound better without them. On inspection it soon becomes clear why, as the grilles create quite a high, straight ridge around the drivers, basically ruining the potential advantages of that wonderful spherical cabinet. Luckily, the magnetic attachment works a treat and removing and re-attaching the grilles is a doddle. Most people even seemed to prefer the looks without them, although opinions varied on that. The Planet L's are an easy load on paper, with a nominal impedance of 8 ohms and a specified sensitivity of 90 dB/Watt. So I initially used them with my Icon Audio Stereo 40 mk3 valve amplifier, which worked very well for the midrange and the top end, but left the lower frequencies sounding a bit soft and woolly. It wasn't unpleasant, but certainly lacked some impact and drive. So I tried my Usher R1.5 transistor power house, and that made things a lot better. The midrange and top end lost a little bit of their magic, but the bass and lower mids improved tremendously. There was considerably more drive and rhythmically things improved too. I was now also able to play a lot louder before things started falling apart, which is always a nice bonus. Mind you, this didn't turn the Planet L's into party speaker: there are still clear limitations in volume, but for normal use in an average room they now provided more than enough volume. What it does show is that these speakers deserve good electronics. You would expect spherical and concentric speakers to throw a great soundstage, and that's certainly what you get, provided you have removed those grilles. The sound is open and completely disconnected from the speakers, with wonderful width and depth and excellent focus. It also is completely natural and unforced, all with spatial reproduction bordering on full 3D. With good life recordings the illusion is complete and the little Elipsons have no trouble transporting you to the recording venue. Just close your eyes and you're there. Obviously, this will only work when you put them far enough from the walls, but other than that the Planet aren't very demanding when it comes to positioning at all. They're also easy on the spectators, as the sweet spot is luxuriously big and will accommodate several listeners with ease. On further listening these speakers soon reveal another talent: they are fantastic with voices. And I mean really fantastic. It is partly the already mentioned soundstaging that helps, but also the wonderfully rich mid-range tonality, the absence of any aggression in the top end and the excellent transparency in the midrange that bring this about. No matter what causes it, voices are utterly beguiling with the Elipsons, especially female voices. This rich tonal purity also works very well with other instruments, obviously, and makes listening more relaxing in general - you just notice it most with voices. It also means that listening fatigue is a concept completely unknown to the Planet L owner. And, even better, all this happens without making them boring. To the contrary, really, as they can be very engaging, just not by being forward, fast or loud, but more by exposing the inner qualities of a performance. Then there's coherence. It is one thing to make a speaker that produces decent bass, mid, and top frequencies, but a completely different challenge to make all these work together as a whole. 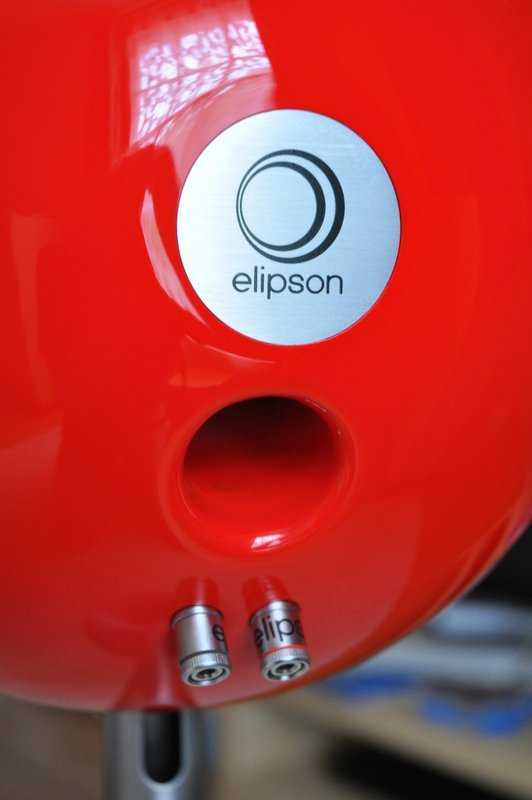 The little Elipsons shine in this respect and produce a sound that is utterly unmechanical and natural. 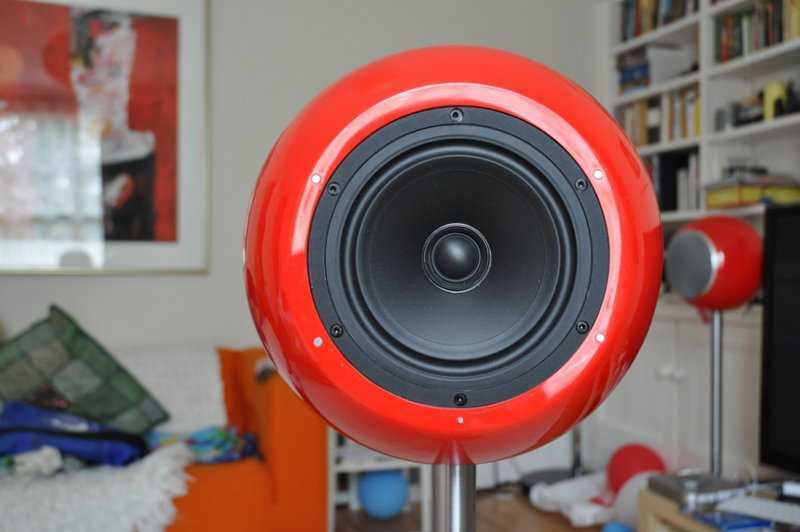 These speakers do not draw any attention to themselves, but instead make you focus on the music. In terms of resolution they are fine too, especially for the crucial midrange. The frequency extremes are a bit less well defined, with the top end not as crisp as it could be and the bass lacking a little bit of drive, texture and extension, but none of this is a serious problem. There's also a quite clear limitation on maximum volume. You wouldn't expect anything else from a speaker this size and price, of course. Even Elipson has to obey the laws of physics. None of these things matter, as long as you use them in small to medium size rooms and don't expect them to do heavy metal any justice. They do lack a little bit of weight too, but this can be improved with the help of a good subwoofer. These Elipsons cannot really match the bandwidth and impact of a bigger speaker, but then most bigger speakers at this price will not even come close to the refinement and spatial presentation of these Elipsons. It's a simple trade-off, as ever, and the Elipsons represent a compromise that I personally would be more than happy to live with. The fact that they look great and are easy to accommodate is a fantastic bonus on top of that. Dismissing these as interior design items would be a big mistake. Granted, they are pretty, but they also sound as good as you can expect a speaker of this price and size to sound. Owners of enormous listening rooms and fans of hard rock need to look elsewhere, but for the rest of us these are just wonderful, captivating loudspeakers. They are especially good at reproducing a realistic soundstage and simply outstanding with voices. More designed to be refined and relaxing than to be loud and imposing, they are an absolute joy to listen to (and to behold) and easily get my highest recommendation.